The legendary hindu sage Mpu Kuturan came to Bali in the 10th century and established the caste system. 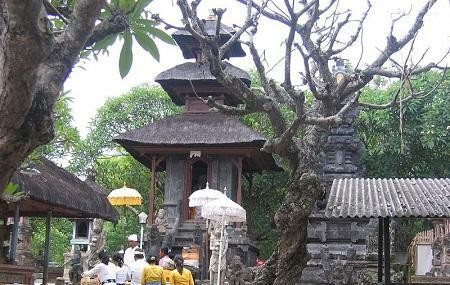 He is thought to have founded this temple, which, if true, would make this one of the oldest Hindu temples in Bali. There are actually four temples on this location, the smallest of which has the best views, overlooking the Blue Lagoon beach. All the temples are on the same headland hill above the Padang Bai village. Try and visit the temple during a religious ceremony, when the entire place fairly buzzes with activity. At other times, especially at sunrise, it’s just a great place to take photographs from. How popular is Silayukti Temple? People normally club together Lotus Lagoon and Blue Lagoon Beach while planning their visit to Silayukti Temple. #letsguide The Silayukti Temple in Padangbai bay is something amazing. The statue of Empu Baradah is facing the Sea. There are several ceremonies conducted here in traditional way which attracts lots of local citizens. What I could observe is the temple, it premises, streets all are littered. Garbage is thrown around everywhere. I'm sure it's not the tourists, but the devotees who visit the temple be responsible. Normally, Balinese people are very particular about garbage disposal and Go Green, Save the Earth principles are followed. But here it's not seen May I request you all locals to take care of Padangbai . Great surounding near the beach. The sound of the wave is peaceful. Sometimes monkeys peep when we are praying. But they are manageable.